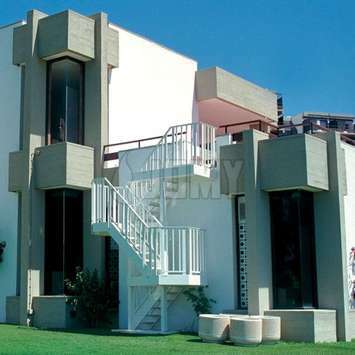 check Different layouts and supporting structures available. check Lightweight but very strong. 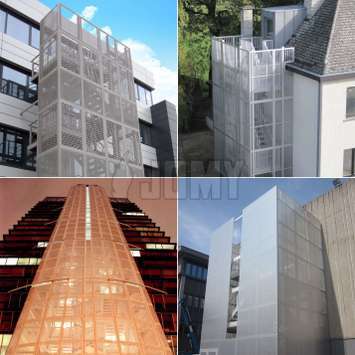 JOMY benefits from specially designed profiles. 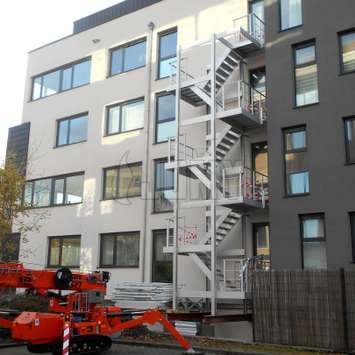 They allow for a "meccano-style" assembly system that will fit perfectly in your specific situation and required measurements. 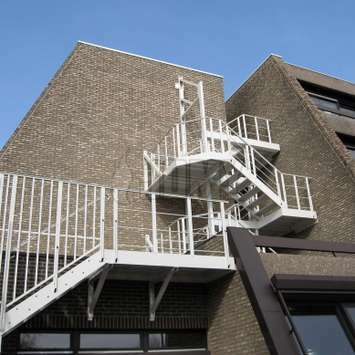 Wether the stairs are used for fire evacuation or access to heights, applicable standards are essential to our engineers. 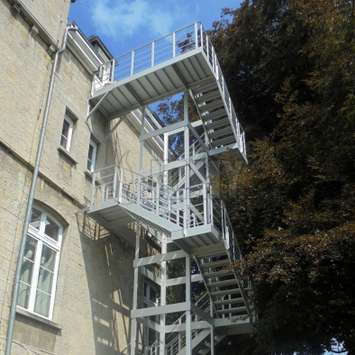 Our exterior stairs are engineered with a default useful load of 102 lb/ft² or 500 kg/m². 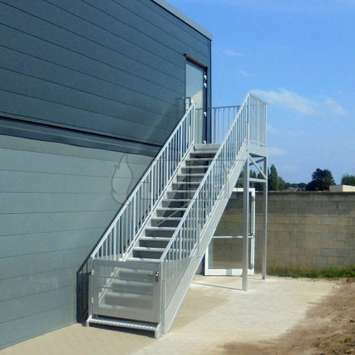 Depending on your situation, our engineers can also develop stairs according to your own load capacity requirements. 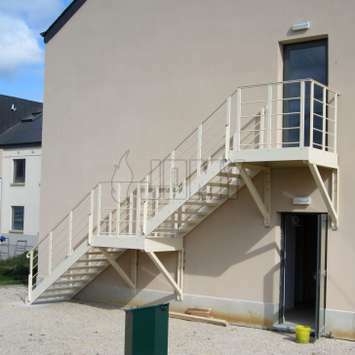 As attested by the following picture, the resistance of our evacuation et access stairs has been tested many times. 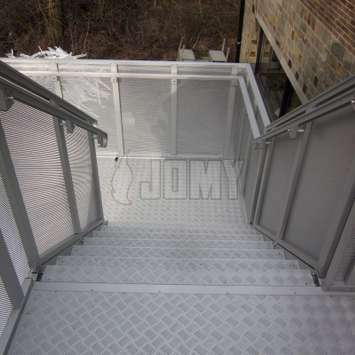 JOMY stairs are made form lightweight aluminium parts, delivered on site in small pieces, easy to handle by manpower. All parts are either screwed together or use pop-rivets for assembly. No welding is necessary on site. Easy, clean and fast! 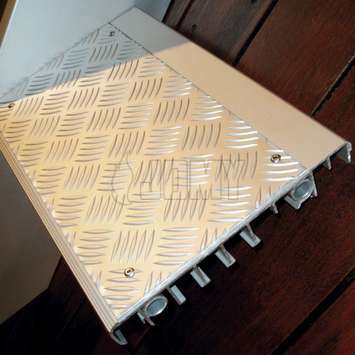 Extruded profiles with anti-slip tread plates with five-bar pattern. 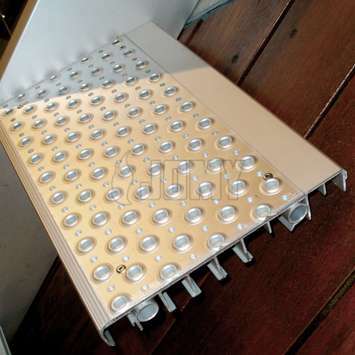 Extruded profiles with anti-slip tread plates with perforations and standing edges. 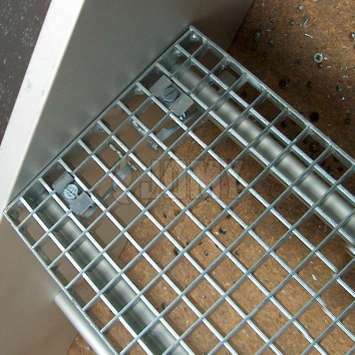 Aluminium or galvanised steel gridplates. 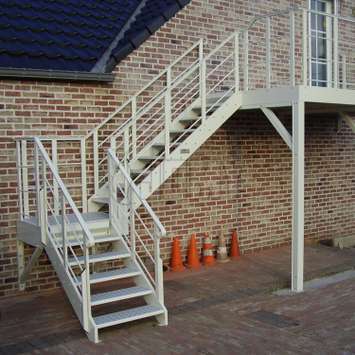 Our stairs can be made more aesthetically pleasing by cutting the edges of the intermediate platforms and only using 2 or 3 central columns as supporting structure. 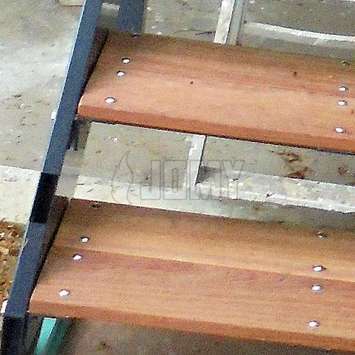 This variant combined with RAL colouring will surely make your stairs more pleasing to the eye. 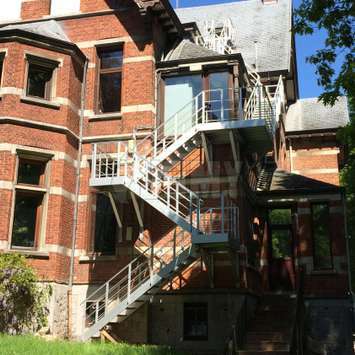 BP: tubes parallel with the angle of the stairs. 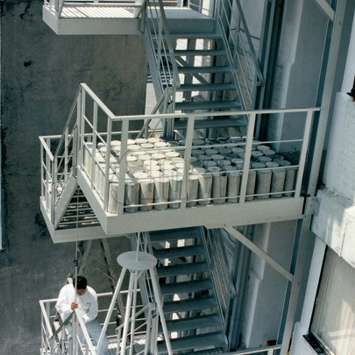 Guardrails made to your design and taste. 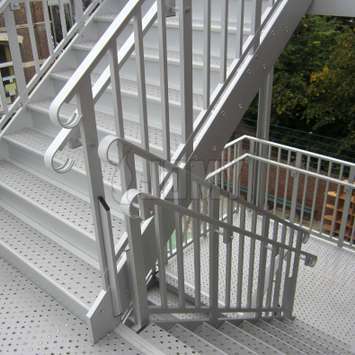 A smooth and easy to use handrail will be placed on top of the guardrails. 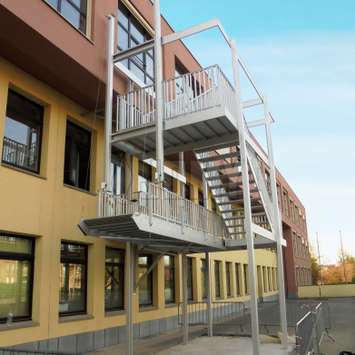 JOMY can provide several handrails each placed at different heights so that children can also use the evacuation stairs safely. By years of experience retractable flights have become a top option from JOMY. Indeed, this level of quality is no match for our competitors. 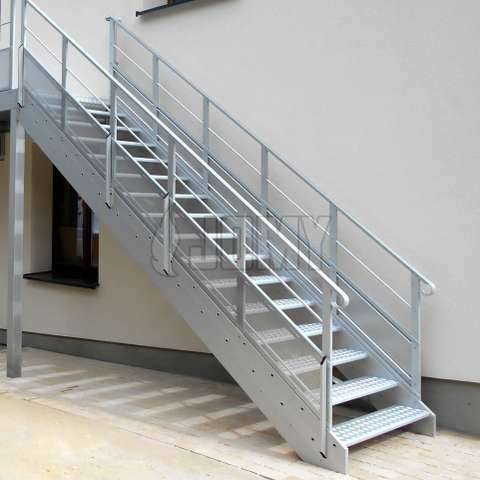 This option will make your stairs burglar resistant and free up ground space. 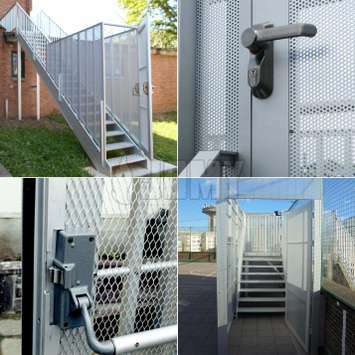 All different gates and doors can be installed on the entrance or exit of the stairs. 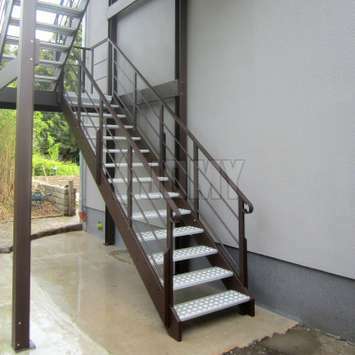 Stairs can be encased with paneling made of aluminium panels, aluminium plates with special perforations, paneling with LEDs, plastic or wood paneling, etc.